Goldrush Potatoes | Henry Field's Seed & Nursery Co.
Main. 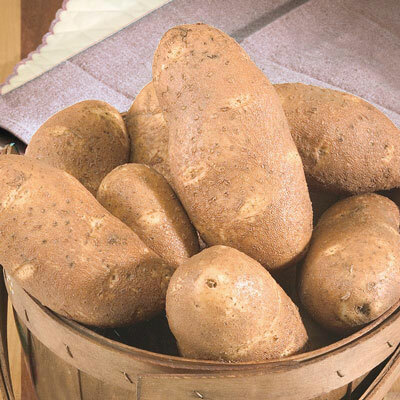 Long, russet-skinned spuds are good baked, boiled or fried! Goldrush has excellent flavor and extremely white flesh that maintains its color even after cooking. Stores well. Resistant to hollow heart, verticillium wilt and scab. Zone 3 - 9 annual. For each offer ordered, get 2 lbs. Spacing: 12-15 inches apart and 30 to 36 inches between rows. Depth: 3 to 5 inches deep. Days To Maturity: 80 - 100 days to maturity. Main season potato . Form: Annual. Vine: Medium to large, slightly upright vine with light red-purple flowers. Soil Requirements: Fertile, well-drained sandy loam soil. pH 4.8 - 5.4 Will grow in higher pH but sometimes become scabby. Seed Count: 2 lbs. of seed potatoes will make approximately 10 - 15 potato sets when cut. Fruit: Oblong and blocky tubers, with medium heavy golden-russet skin. Tuber flesh is white and eyes are shallow and well distributed. Yield: Medium to high yields.